Posts tagged "what is smart iptv app"
Imagine that every day when you get back from work or school, you turn the TV on for a relaxing time and your favorite show has been ended. You have to watch some boring TV programs instead of a fascinating reality TV show. Wouldn’t it be better if watching TV were more like browsing the Web, so you could pick the program you wanted to watch whenever and wherever you felt like watching it? So Internet Protocol Television (IPTV) absolutely is the solution you are looking for, IPTV uses Internet technology to deliver TV programs “on demand. And the question here is ” How does it work? What benefits will it bring us? Why you should use IPTV? What is iptv – From a TV watcher’s point of view, IPTV is very simple: instead of receiving TV programs as broadcast signals that enter your home from a rooftop antenna, satellite dish, or fiber-optic cable, you get them streamed (downloaded and played almost simultaneously) through your Internet connection. Unlike downloaded media, IPTV offers the ability to stream the source media continuously. As a result, a client media player can begin playing the content (such as a TV channel) almost immediately. This is known as streaming media. To understand how IPTV is different from traditional TV, let’s compare traditional mode of viewing TV with IPTV. Cable and satellite both function by enabling users to adjust to specific channels within that signal and the fundamental difference is that cable is via a wired connection whereas satellite is wireless till it reaches your house. IPTV uses Internet protocol (IP) based network to deliver TV channels to users’ set-top box. Internet networks differ from cable and satellite by offering content through the same client-server model that renders email, websites, and other Internet-based services. As we will see mentioned further in this blog, IP or Internet Protocol is the language that is used for transferring data packets between computers attached to the internet network. Unlike cable or satellite where content is broadcast in real time, on a transmit and forget the model, IPTV has the ability to store the programming on servers at transmitting end, allowing users to request the content over the Internet at any time. 2. 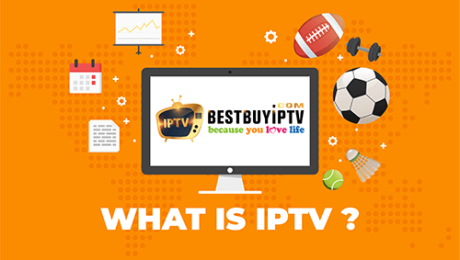 What are IPTV types? Video on demand (VOD): you can select a TV program or movie you want to watch from a wide range, pay your money, and watch it there and then. Live television and live media, with or without related interactivity. All three forms of IPTV can work either using your computer and an ordinary web browser, through a set-top box to show on your television screen, even on a mobile device like a cell phone or an iPod… All three can be delivered either over the public Internet or through a managed, private network that works in essentially the same way. 3. How does IPTV work? At this time definitely, you are looking forward to finding out more about how to use IPTV, which devices are compatible. Now starting to register an account cannot be easier, all you have to do is enter your email address and select your device type, then wait for an email with login information. With BestbuyIPTV after register, you will have 48 free trial hours to experience the service before making up your mind in the subscription. After having a trial account, you go to set up your device and begin to enjoy !!! TAG: what is iptv service, what is smart iptv, what is the best iptv service, iptv playlists, what is smart iptv app, what is iptv stalker addon, what is iptv player, what is iptv m3u, what is iptv 2017, what is iptv roku, what is iptv setup, what is iptv bouquet, what is iptv on smart tv, what is iptv openbox, what is iptv for kodi, what is iptv channels, what is iptv server, what is iptv restream, what is iptv panel.